Galapagos tortoises summon up images of great, lumbering beasts on idyllic islands that planted the seeds of natural selection in the young naturalist, Charles Darwin. In a recent paper, Poulakakis et al. (2015) provide genetic evidence of two lineages of tortoises that until recently were thought to be a single named species, Chelonoidis porteri, on the island of Santa Cruz. The two species occupy different parts of the island and the team were urged to assess their genetic structure. 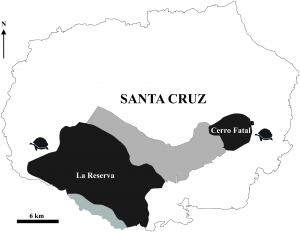 Geographic distribution of the two known lineages of giant tortoises on Santa Cruz Island: Chelonoidis porteri (Reserva) and Chelonoidis sp. nov. (Cerro Fatal) from Poulakakis et al. (2015). The new species is found in Cerro Fatal and the team named it Chelonoidis donfaustoi. C. donfaustoi is genetically distinct based on microsatellites and nucleotide differences at the mitochondrial control region, even from the species on the same island located in Reserva! Analyses of DNA from natural populations and museum specimens, including the type specimen for C. porteri, confirm the genetic distinctiveness of these two lineages and support elevation of the Cerro Fatal tortoises to the rank of species. Fausto Llerena Sánchez who devoted 43 years of service (1971–2014) to giant tortoise conservation as a park ranger within the Galapagos National Park Directorate. 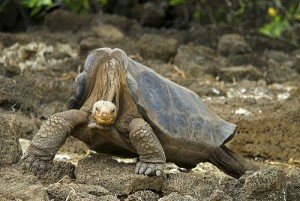 Several tortoise lineages in Galapagos remain extant in large part due to Don Fausto’s dedication, ingenuity, and patience. But what does this have to do with Lonesome George, the tortoise found wandering on his own in 1972 … the last of his kind? Member of the team that published this new species from Santa Cruz were also collecting samples in 2008 when they stumbled across tortoises on Isabela Island that had high levels of Pinta DNA, the island and genetic stock from whence George came. Sailors and other seafaring types used to take the tortoises for food and, believe it or not, ballast (although seeing as they can be quite large and heavy, perhaps that’s not so surprising). Apparently, some of the tortoises were surplus and would be jettisoned overboard. Cruel, yes, but the tortoises could float and keep their long necks above water. It seems some ended up on Isabela near Wolf Volcano in Banks Bay. They haven’t moved. Based on the genetic data, scientists, including geneticist Adalgisa Caccone, are planning on using captive breeding programs in order to release new Pinta and another lost lineage, the Floreana, back to their native islands. The taxonomy of giant Galapagos tortoises (Chelonoidis spp.) is currently based primarily on morphological characters and island of origin. But, the use of molecular tools has shed light about the genetic structure of the islands and the relationships between different species of tortoises. Perhaps George wasn’t so lonesome after all. This entry was posted in conservation, DNA barcoding, natural history, pedigree, population genetics and tagged breeding, conservation, DNA, tortoises. Bookmark the permalink.